Because of this feature the sensor is especially well adapted to level control for containers of every type. The process connection of the sensor is carried out with the tried and tested, elastomer-free, EHEDG and 3-A certified hygiene build-in unit from Negele. Additionally there are numerous suitable adapters such as TriClamp, Milchrohr (Milk tube), Varivent, DRD and may others available. Thus it is any easy step to adapt the sensor to existing process connections or to match it with an existing plant standard. 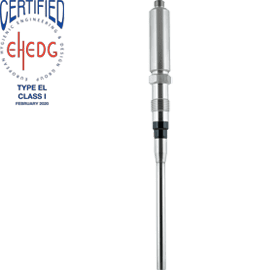 The measuring rod consists of stainless steel 1.4404, the insulating element that simultaneously functions as a watertight cone is made of FDA approved PEEK plastic. Because of the high hygiene standard of the modular unit and choice of materials the NSK is therefore best suited for sterile.applications and fully CIP-capable, and in the optional high temperature version, also SIP-capable. In froth-producing operations the potentiometric measuring process is able to demonstrate its strengths against the contactless (ultrasound or radar) processes. Apart from an incorrect measurement with foaming media, with contactless measurement there can be in the worst case no measurement whatsoever. The reason for it is that the electromagnetic waves transmitted are completely absorbed by some foam and therefore no reflection takes place. Because of the considerably lower conductivity of the foam by comparison to the fluid medium, measurement errors with the NSK that are caused by foam are so slight that they are in practice negligible. Contactless measuring systems often cannot record rapid level changes because of their inertia. The rapid updating of measured values already mentioned with the NSK, by contrast records rapid changes too without difficulty. 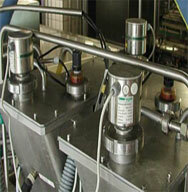 The NSK continuous level sensor is usually applied for small pressurised tanks such as are found in breweries. 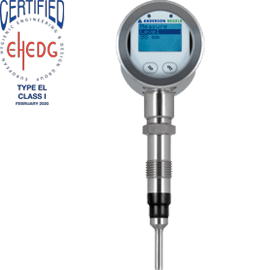 As mentioned earlier, the hydrostatic measurement of pressure difference does not always fulfil the accuracy requirements of the users. A contactless measurement is often too expensive for such applications. A highly accurate and also more economical solution is the NSK continuous level sensor from Negele.The main application of the NSL is in presettling containers of filling equipment and supplies an important parameter for the regulation of the feeding pressure there. Very accurate dosage procedures in filling equipment can be carried out with the NSK on account of its very short response time, since the changing level and its associated feeding pressure can be very rapidly ad justed on account of its short response time.Particularly for filling equipment containing changing and pasty products the NSK is most suitable, remembering the above mentioned reasons, for an accurate level measurement with the highest standards of hygiene. 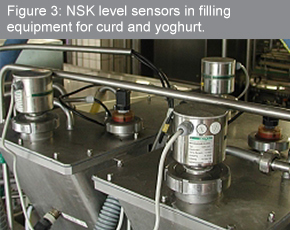 The sensors in the application photo are installed into the presettling tanks of a filling machine in a dairy. Here they are utilised through optional milk tube adapters in the existing process connection. The sensors in this case carry out the level measurement which is the essential criterion for the regulation of feeding pressure. Here, media such as curds and yoghurt, for example, are being filled. It is important for successful operation that adhesions that always occur with such media do not corrupt the measurement. 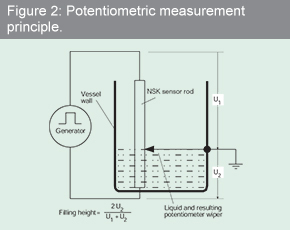 The NSK meets this requirement on account of the measurement principle.When a medium is changed such as it is often the case here, the sensor can also contribute considerably to the flexibility of the user, since, as already described, no re-adjustments are needed when changing the product. This increases speed and thus the efficiency of the unit. The short response time, together with proven filler unit technology is a guarantee that, tub by tub, the same quantity will be delivered.